Uri: The Surgical Strike is a 2019 Indian Hindi-language military action film written and directed by Aditya Dhar in his debut, and produced by Ronnie Screwvala under the banner of RSVP Movies. The film features Vicky Kaushal, Paresh Rawal, Mohit Raina, and Yami Gautam in lead roles. A dramatised account of the retaliation to the 2016 Uri attack, the film follows Major Vihaan Singh Shergill of the Indian Army, who plays a leading role in organizing it. Uri was theatrically released on 11 January 2019, and it grossed over ₹347 crore worldwide. The film is divided into five chapters. The first chapter opens up with an ambush in June 2015 on the convoy of the Indian Army troops in Chandel, Manipur by NSCN(K) militants. In retaliation, Major Vihaan Singh Shergill (Vicky Kaushal), a Para SF officer and his unit including his brother in law Major Karan Kashyap (Mohit Raina) infiltrate and attack the Northeastern militants and also kill its key leader responsible for the ambush. After a successful strike the Prime Minister of India congratulates him and the whole unit at a formal dinner. Vihaan requests an early retirement as he wants to be close with his mother who is suffering from Stage VI Alzheimer's on which the Prime Minister offers him to a desk job at New Delhi near his mother instead of retirement to which he agrees. The second chapter shows Vihaan taking a desk job at the Integrated Defence Staff HQ in New Delhi and him spending time with his family. This segment also shows a brief description of the Pathankot attack. A nurse named Jasmine d'Almeida (Yami Gautam) is assigned to take care of Vihaan's mother. Vihaan meets an Indian Air Force pilot named Captain Seerat Kaur (Kirti Kulhari) who is trying to prove her patriotism to her deceased husband who was an army officer who died in an ambush. One fine day his mother goes missing. He searches for her and he blames Jasmine for ignorance and tells Jasmine that there is no need of her security. Vihaan's mother is found under a bridge and Jasmine reveals herself as an intelligence agent. The film reveals a note of why the families of the special forces soldiers were given security due to threat from the North-eastern terrorists. During the planning, Govind ropes in ISRO (for providing satellite images), DRDO (for drone surveillance) and RAW (for intelligence). At DRDO, he meets an intern named Ishaan who had developed a drone called Garuda which looks and shaped like an Eagle. With the help of the drones and satellite images they are able to get the exact location of the hideouts and training camps of the terrorists. Jasmine reveals her true name as Pallavi Sharma to Vihaan. During an interrogation, Vihaan and Pallavi are able to get the information about the handlers of the attack. He chooses Seerat to be his pilot. Govind also suggests to intensify the artillery shelling at the border for distraction and also to paint their assault helicopters with Pakistani Air Force markings. The commandos also start training under Vihaan. The Pakistani officials suspect the Indian activities but dismiss it due to underestimation. On the night of 28 September the commandos leave for the strike in Pakistan-administered Kashmir in Mi-17 helicopters. During the mission Vihaan's helicopter is forced not to cross the Line of Control due to latest intelligence from spies in Pakistan that the Pakistani Army has Deployed an "AWAC" Early Warning Radar based Surface to Air Missile System to bring their Helicopter down. Vihaan improvises by going on foot through a cave (which was very risky due to darkness and the unknown presence of terrorists). His team successfully infiltrate and kill all the terrorists on the two launchpads. Similarly, other commando teams also manage to kill all of the terrorists. Vihaan kills Idris, the main perpetrator of the Uri attack in a hand-to-hand combat. The local police are alerted and the commandos who are low on ammunition and time escape. On their way back, they are heavily rained down upon by gunfire from both a nearby machine gun bunker and a Pakistani Air Force Mi-17 Helicopter which was scrambled to intercept Vihaan's team. Captain Seerat comes to their rescue by firing back both at the Pakistani gunship thus driving it away and eliminating the machine gun bunker. Vihaan's team successfully crosses LoC on the Indian side with no casualties. The rest of the assigned teams are also successful and are back with no casualties. Vihaan lands at Hindon Air Force Station at Ghaziabad. Pallavi gets acquainted with Seerat. The film ends with Vihaan, Pallavi, Govind and the commandos happily having a formal dinner with the Prime Minister. Uri was announced by producer Ronnie Screwvala after one year of the surgical strike in September, 2017. The film was directed by debutant Aditya Dhar. He said that the film is "the story of what was imagined to have happened in those eleven days." The principal photography began in June 2018 and was finished in September. Kaushal went through extensive military training for five months and gained weight. He trained for five hours a day and three to four hours of military training to enhance the stamina. He also received gun training at the naval base in Cuffe Parade in Mumbai. He called it "physically the most challenging film for me". He injured his arm while filming an action sequence in it. Kaushal and the supporting cast trained at Mumbai’s Navy Nagar with Captains and Majors teaching them slithering, using arms and ammunitions and other drills used by the armed forces. Uri was largely shot in Serbia and was wrapped up in Mumbai. The Indo-Pak border, the LOC and other areas resembling military posts and terrorist camps were recreated in Serbia. Yami Gautam underwent mixed martial arts training. She called the process of shooting as "exhausting yet enjoyable." The film also stars Paresh Rawal, Mohit Raina, Ivan Rodrigues and Kirti Kulhari . Screwvala said that the film has elements of "war, action, and strategy based on a true story" that the "Indian audience is yet to watch such experience in cinema." A teaser was launched one day before the second anniversary of the strike on 27 September, 2018. The official trailer of film was released on 5 December 2018. The film was released on 11 January 2019. To curtail piracy, the makers of Uri: The Surgical Strike deployed a 3.8 gigabyte fake version of the film over networks like torrent. However, the film was leaked by the bootleg website Tamilrockers within a week of release..The satellite and digital rights of the film were bagged by Zee Network for a huge price. The film has a score of 70% on Rotten Tomatoes based on reviews by 10 critics. Namrata Joshi writing for The Hindu stated: "Whichever side of the political divide one may stand, one can't dismiss Dhar's canniness and craft, despite knowing that he is lionising the obvious and providing a one-sided narrative." Amman Khurana of Times Now News, giving 3 stars out of 5, comments: "Uri: The Surgical Strike is a rather mature film. It somehow knows that it is catering to the viewer that is tired of watching the men in uniform who thump their chests to show their love and passion for the country." He further has to say: "The stunning cinematography and the VFX work ensure that Uri: The Surgical Strike does not pass off as a comic-book account of the operation." He concludes: "Uri: The Surgical Strike is a good one-time watch. If not for anything else, watch it for Vicky Kaushal, who brings the right amount of intensity to his role and drives the film from start to finish." Taran Adarsh rated the film 3.5 stars out of 5, says "Uri is one film that *should* be watched… Absorbing screenplay, superbly executed combat scenes, efficient direction Aditya Dhar… Uri is thrilling, gripping, instills patriotism, without getting jingoistic." Raja Sen writing for Hindustan Times stated: "While watching Uri, I kept wondering about the point of such a self-congratulatory film," and rated it 2 stars out of 5. Uri: The Surgical Strike in opening weekend earned ₹35.73 crore from domestic circuit. In the first weekend the film collected ₹70.94 crore from pan India. As of 24 February 2019[update] it grossed ₹300.03 crore from India and ₹47.29 crore (US$6.6 million) from overseas taking the worldwide gross collection to ₹347.32 crore (US$48 million). The film crossed the ₹100 crore (US$14 million) mark in gross collection on 8th day of its release. It took 15 days to gross ₹200 crore (US$28 million) and in its fourth week of release it grossed ₹300 crore (US$42 million) worldwide. Shashwat Sachdev composed songs for the film. Kumaar, Raj Shekhar and Abhiruchi Chand are the lyricists. 1 2 "Uri: The Surgical Strike". Times of India. 26 December 2018. Retrieved 29 December 2018. ↑ "Uri - The Surgical Strike Is A Potential BLOCKBUSTER". Box Office India. 18 January 2019. 1 2 3 4 5 "Uri Box Office Collection till Now - Bollywood Hungama". Bollywood Hungama. Retrieved 25 February 2019. 1 2 3 4 "Bollywood Top Grossers Worldwide Bollywood Hungama". Bollywood Hungama. Retrieved 25 February 2019. ↑ "Raazi for any role". Telegraph India. ↑ "Vicky Kaushal: If a role scares me in a good way, I want to play it". Times of India. ↑ "Uri teaser: Vicky Kaushal starrer on Indian Army's surgical strike looks promising". The Financial Express. 28 September 2018. Retrieved 28 September 2018. ↑ Bhanot, Saurav (9 January 2019). "The real story of 'Uri: The Surgical Strike' Movie: What happened in the Uri attack and how did India respond?". GQ India. Retrieved 2019-01-31. ↑ "Check out Vicky Kaushal's intense soldier look from Uri, a film based on surgical strike". Mumbai Mirror. Retrieved 28 September 2018. ↑ "URI: The Surgical Strike - Cast, Plot, Review". ↑ "Uri and The Accidental Prime Minister movie review and release highlights". January 11, 2019. 1 2 Ata Hasnain, Syed (24 January 2018). "Ex-Uri Brigade Commander: "You Watch a Film for Fun, Not Facts"". The Quint. Archived from the original on 31 January 2019. Retrieved 2019-01-31. ↑ Rangan, Baradwaj (17 January 2019). ""Uri: The Surgical Strike"… Not so much a war movie as a 'Hukumat'-style revenge drama, but it works". Baradwaj Rangan. Archived from the original on 31 January 2019. Retrieved 2019-01-31. ↑ "Uri Movie Review: An engaging account of real events with a cinematic touch". Madras Cinephile. 24 January 2019. Retrieved 2019-01-31. ↑ Ajaz, Mahwash (12 January 2019). "We asked a Pakistani Bollywood buff to review Uri & she has a request for Indian directors". The Print. Retrieved 31 January 2019. ↑ Jhunjhunwala, Udita (11 January 2019). "Uri: The Surgical Strike movie review — Vicky Kaushal delivers top-notch performance in potent war drama". Firstpost. Retrieved 2019-01-31. ↑ Bamzai, Kaveree (13 January 2019). "NSA Ajit Doval hasn't seen Uri, but will be more than pleased when he does". The Print. Retrieved 31 January 2019. ↑ "A year after surgical strikes, Ronnie Screwvala announces URI starring Vicky Kaushal". The Indian Express. 19 September 2017. Retrieved 18 November 2018. ↑ "Vicky Kaushal embarks on 'Uri' journey". The Times of India. 9 June 2018. Retrieved 18 November 2018. ↑ "View picture: It's a wrap up for Yami Gautam and Vicky Kaushal's Uri". Pinkvilla. 5 September 2018. Retrieved 18 November 2018. ↑ "Uri first look poster: Vicky Kaushal gets ready to lead his paratroopers in surgical strikes across the LoC". Firstpost. 28 September 2018. Retrieved 28 September 2018. 1 2 Dubey, Rachna (28 September 2018). "Vicky Kaushal: 'Uri' was physically the most challenging film for me". The Times of India. Retrieved 18 November 2018. ↑ Bhowal, Tiasa (17 July 2018). "Vicky Kaushal Injures Arm While Filming Uri, Keeps Shooting". NDTV. Archived from the original on 18 July 2018. Retrieved 19 July 2018. 1 2 Iyer, Sanyukta (25 May 2018). "Vicky Kaushal to play a Para Commando in Uri". Mumbai Mirror. Retrieved 18 November 2018. ↑ Gupta, Rachit (2 June 2018). "Yami Gautam gets a makeover for her role in 'Uri'". The Times of India. Retrieved 18 November 2018. ↑ Dubey, Pranita (1 October 2018). "Yami Gautam Says Shooting For Films Like Uri Is 'Never Easy'". NDTV. Retrieved 18 November 2018. ↑ "Producer Ronnie Screwvala on Mard Ko Dard Nahi Hota: It was a calculated risk taken with conviction". The Indian Express. 31 October 2018. Retrieved 18 November 2018. ↑ "Uri teaser: Vicky Kaushal's military drama will leave you with goosebumps". The Indian Express. 28 September 2018. Retrieved 28 September 2018. ↑ "URI - Official Trailer - Vicky Kaushal, Yami Gautam, Paresh Rawal - Aditya Dhar". YouTube. ↑ "'URI' Makers Know How to Prevent Illegal Leak on Torrents". The Quint. Retrieved 2019-01-17. ↑ "Uri full movie leaked online by Tamilrockers". January 22, 2019. ↑ "Uri: The Surgical Strike Movie Review: Mission accomplished, but not without casualties". Times Now News. 9 January 2019. Retrieved 9 January 2019. ↑ Taran Adarsh [@taran_adarsh] (9 January 2019). "#OneWordReview #UriTheSurgicalStrike: IMPACTFUL. 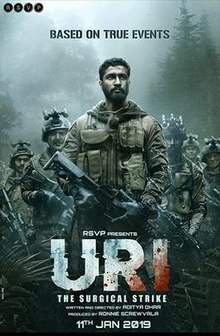 Rating:⭐️⭐️⭐️½ #Uri is one film that *should* be watched… Absorbing screenplay, superbly executed combat scenes, efficient direction Aditya Dhar… #Uri is thrilling, gripping, instills patriotism, without getting jingoistic. t.co/tTkEE1H50u" (Tweet) – via Twitter. ↑ Sen, Raja (11 January 2019). "Uri review: Vicky Kaushal leads an efficient but unimpressive attack". Hindustan Times. Retrieved 18 January 2019. ↑ "Vicky Kaushal on 'Uri: The Surgical Strike' dialogue 'How's the Josh' going viral". Times of India. 2 February 2019. Retrieved 3 February 2019. ↑ "How's the josh asks prime minister Narendra Modi". Times of India. 21 January 2019. Retrieved 3 February 2019. ↑ "Watch: Indian cricket team celebrates New Zealand series win with 'How's the Josh' chant". Indian Express. 4 February 2019. Retrieved 5 February 2019. ↑ "Mumbai Police uses Uri's 'How's the josh' to raise awareness about cybersecurity". Indian Express. 23 January 2019. Retrieved 3 February 2019. ↑ "Uri: The Surgical Strike - Original Motion Picture Soundtrack". Saavn.